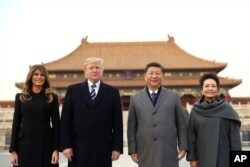 U.S. President Donald Trump is holding talks with Chinese President Xi Jinping in which the U.S. leader has said he intends to press Beijing to get North Korea to abandon its nuclear weapons program. At a welcoming ceremony early Thursday at the Great Hall of the People in Beijing, the two leaders walked side by side on a red carpet. The U.S. and Chinese national anthems were played by a military band and ceremonial cannon fire from Tiananmen Square saluted Trump. 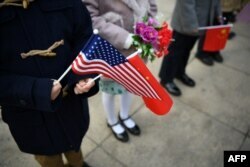 A crowd of jumping and gleeful schoolchildren waved American and Chinese flags. The two leaders began talks behind closed doors. In the early afternoon, they are to appear jointly before journalists and make statements. It is the first visit by Trump to China, which is North Korea’s closest and only remaining significant ally. The U.S. president is expected to request China expel North Korean workers from the country and eliminate some of its other significant remaining dealings with Pyongyang. In remarks made during their extended bilateral talks, Trump said to Xi, regarding North Korea: "I believe there is a solution to that as you do." The talks between Trump and Xi will also deal with trade, a touchy subject because Trump has long complained about the trade deficit between China and the United States. Children hold national flags before the arrival of China's President Xi Jinping and U.S. President Donald Trump during a welcome ceremony at the Great Hall of the People in Beijing, Nov. 9, 2017. China’s trade surplus with the United States has widened by 12.2 percent in the past year, reaching a total of $26.6 billion, according to Chinese customs data. "Past administrations allowed it to get so far out of kilter," Trump said. Yet, the Trump administration is showcasing several business deals signed during the China trip, including a deal for China’s biggest online retailer to buy $1.2 billion of American beef and pork. Trump is also to meet Thursday with Chinese Premier Li Keqiang, whose position is similar to that of a prime minister. 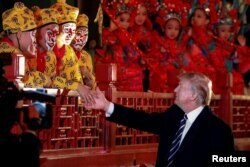 President Donald Trump shakes hands with opera performers at the Forbidden City in Beijing, China, Nov. 8, 2017. The U.S. president arrived in Beijing a day after delivering a speech in Seoul, South Korea, in which he called on other nations to unite and “isolate the brutal regime of North Korea,” Trump said in his speech. “You cannot support, you cannot supply, you cannot accept,” he added. The U.S president referred to North Korea as “a total failure,” and a “twisted regime” ruled by a cult and a tyrant who enslaves his people — a characterization certain to provoke a harsh rhetorical reply from Pyongyang. The U.S. leader had effusive praise for South Korea, contrasting its economic success with the dark situation in the North. 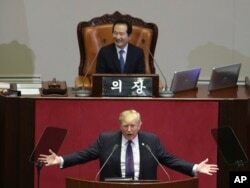 “The more successful South Korea becomes, the more decisively you discredit the dark fantasy at the heart of the Kim regime,” said the U.S. president. Speaking on Air Force One on the approach to Beijing Wednesday, a senior White House official said President Trump and the South Korean leader had reaffirmed their commitment for a coordinated global pressure campaign to bring North Korea back to “authentic denuclearization talks,” while also remaining committed to use a “full range of military capabilities” to defend South Korea and Japan. FILE - South Koreans protest against North Korea and Kim Jong Un during a rally near the U.S. Embassy in Seoul, South Korea, Nov. 6, 2017. 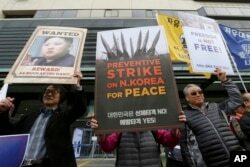 “Authentic” talks, the U.S. official said, would be without preconditions and would entail North Korea agreeing to “reduce the threat, end provocations, and move toward sincere steps to ultimately denuclearize.” Preconditions like refusing to put nuclear weapons on the table, the official said, “is a nonstarter” for the United States. The U.S. also maintains that any agreement would need to include verification of denuclearization efforts — a key sticking point in multi-nation negotiations that have been attempted in the past. In a statement issued separately, White House Press Secretary Sarah Huckabee Sanders said Trump would also make a determination on whether the United States will designate North Korea as a state sponsor of terrorism before the end of his visit to China.